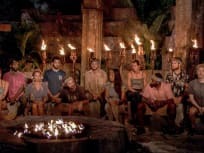 On Survivor: Davids vs Goliaths Season 37 Episode 13, a puzzle and a fire-making challenge change one person's fate as a castaway takes home the $1 million. On Survivor: David vs. Goliath Season 37 Episode 12, after a crucial immunity challenge, one castaway will earn a one-in-six chance at being Sole Survivor. 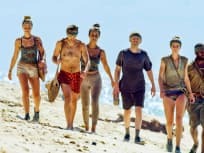 On Survivor David vs Goliath: Season 37 Episode 11, a tribal blindside could create a crack in the Mason-Dixon alliance and loved ones visit the castaways. On Survivor: David vs Goliath Season 37 Episode 10, the boundaries between tribes become blurred as another castaway is voted out of the game. 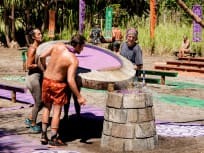 c Season 37 Episode 9, an argument between two castaways could end a showmance and a reward sends someone to the burger bar. On Survivor: David vs. Goliath: Season 37 Episode 8, balance is tested in a stressful immunity challenge and one castaway is called out by their tribe. On Survivor: David vs Goliath Season 37 Episode 7, a new unlikely pair may choose to work together when alliances between the Davids and Goliaths are tested. On Survivor: David vs. Goliath Season 37 Episode 6, tribes battle to win a food reward and the bond between the "Brochachos" becomes a personal achievement. 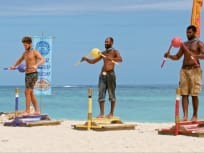 On Survivor: David vs. Goliath Season 37 Episode 5, after another balancing act during a grueling challenge, yet another castaway is voted out of the game. "Time to Bring About the Charmpocalyps"
On Survivor: David vs Goliath Season 37 Episode 4, castaways from the both tribes must learn to work together after a surprising tribe swap. On Survivor: David vs. Goliath Season 37 Episode 3, a paranoid castaway calls a tribal meeting to put a stop to all of the side conversations causing conflicts. "The Chicken Has Flown the Coop"
On Survivor: David vs. Goliath Season 37 Episode 2, the castaways are all left hanging on while a member of one tribe is voted out of the game. 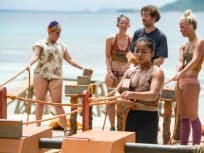 On Survivor Season 37 Episode 1, the "David" tribe tries to take down the "Goliath" as a vicious cyclone rips through the castaways emotions on the first day.